(Reuters) Opening statements in a rare criminal economic espionage trial are expected to begin on Wednesday in a case where prosecutors accuse a U.S. citizen of conspiring to steal trade secrets from chemical giant DuPont for the benefit of a Chinese company. California businessman Walter Liew is accused of paying former DuPont engineers for assistance in designing a white pigment — chloride-route titanium dioxide, also known as TiO2 — used to make a range of white-tinted products, including paper, paint and plastics. Liew, his wife and another man charged in connection with the events pleaded not guilty. His wife will be tried separately. Liew’s attorneys have argued that the information in his possession were not DuPont trade secrets, but rather publicly available information. The United States has identified industrial spying as a significant and growing threat to the nation’s prosperity. . . .
. . . . Prosecutors contend in court filings that Liew was hosted at a banquet in 1991 by Luo Gan, who at the time was a high-ranking official of the Communist Party of China Central Committee. Luo Gan went on to become a member of the nine-member Standing Committee of the Politburo, prosecutors wrote in a court filing. Several other Chinese officials also attended, according to correspondence from Liew that U.S. federal officials say they seized from his safety deposit box. Chinese officials “desperately wanted” the technical know-how to cleanly manufacture white pigment and California engineer Walter Liew told them he could provide it, a U.S. prosecutor told jurors. Except Liew didn’t have the knowledge, the prosecutor said. So he stole it from DuPont Co., the world’s largest producer of the pigment, and gave it to a Chinese state-owned company for $28 million in contracts, Assistant U.S. Attorney John Hemann said yesterday in San Francisco, where Liew is on trial, accused of conspiracy, economic espionage and trade secret theft. Liew, a poor Malaysian farmer’s son who emigrated to the U.S. in 1980, and co-defendant Robert Maegerle, a 78-year-old ex-DuPont engineer, say trade secrets played no role in the plans they delivered to help a Chinese company in the $14 billion global market for white pigment. . . .
. . . . Liew, of Orinda, California, and Maegerle, a Delaware resident who retired from DuPont in 1991, are among more than 20 people charged in recent years with stealing U.S. technology for China. Do the right thing when no one is looking. No one is entitled to anything. Credit is a promise to pay. Our national security is our national economy. We all need to pull our own weight; we also need to have each other’s back. We need to make this country strong. You are the solution to our problems. This is still a country by the people and for the people – WE are the people. Die fighting for America’s rights and freedom. Stupid people cannot be free people. Rededicate yourself to your family and your job; doing so will help this country more than anything. If we only think about security the day we get the security briefing, we lose. Always have a D*I*C*E day. 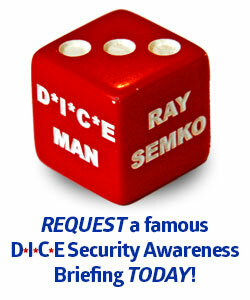 Ray Semko, the D*I*C*E Man, is a well-known security expert providing his signature "Defensive Information to Counter Everything (DICE) security awareness briefings to the government, contractors and public. Copyright 2018 Ray Semko; The D*I*C*E Man . 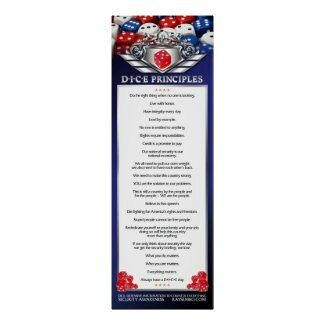 . . Have a DICE Day!